Announcement Follow Fox Majeure on Instagram @mononavare for the latest shop updates, coupon codes, info on early childhood development, raising multilingual kids, art and craft tutorials. Follow Fox Majeure on Instagram @mononavare for the latest shop updates, coupon codes, info on early childhood development, raising multilingual kids, art and craft tutorials. My shop is 5 today! To celebrate I'm giving 5%off for each of these years - 25% on everything. December 1st till midnight CT.
ETSY25OFF is the magic code. Follow my Instagram - MonoNAvare, direct link is in my shop announcement - for future promotions. 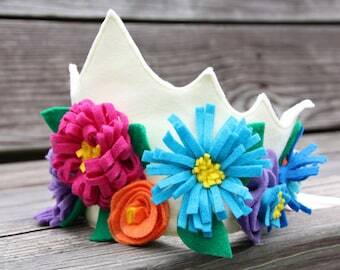 Just another color variation of the felt flowers crown. This very one and the alike from the listing are on their way to Disneyland - will be making grandma and granddaughter adventures in the Magic Kingdom even more special. 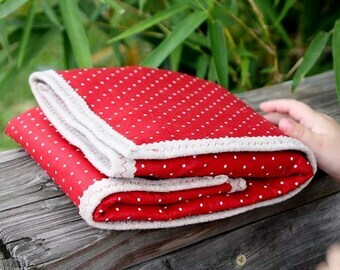 My first intentional creative impulse came when I was about five: I chopped two large patches out of my Granny’s curtain. I saw endless creative possibilities; others - nothing but huge holes in the drapery. Nevertheless, that was the beginning! 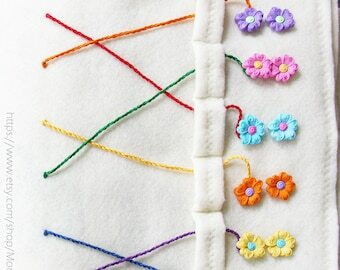 Since then I mastered different crafts leaning towards working with fibers and textile. Whatever I made I gave as gifts to friends and family. Kids grew up with my toys and still treasure them years past. And then once… I made an impromptu sale. On a 12 hours Transatlantic flight my then 18 months old son was genuinely engrossed into playing with a sensory book I’ve made. Our fellow traveler insisted to buy the book literally on-the-fly endorsing my handwork very generously. I had no more excuses for not selling my work. 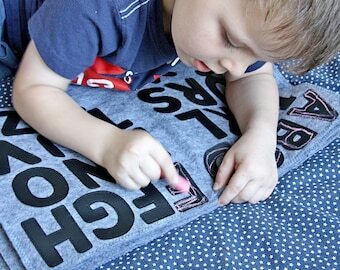 Though not all items in my shop are intended for children only, everything is test-driven and approved by the real kid. Since 2011 my son Filipp was the the inspiration and the first recipient (or better to say the first responder :) to sensory books, play mats, pretend play items, toys. Initially open under the name MonoNoAvare my shop emerged into Fox Majeure. Filipp expanded his role of a model and a test-driver into a fully fledged team member - my design adviser and independent creator of soon-to-be-introduced postcards. Today my items continue their life journeys in 21 countries. 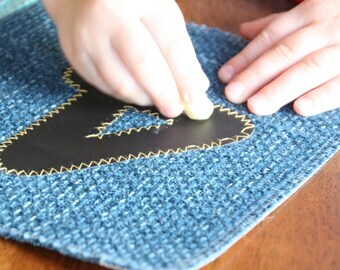 I make exclusive lines of sensory books for boutiques in Nantucket and New York. Currently I am working on expanding my cooperation with rehabilitation and occupational therapists. 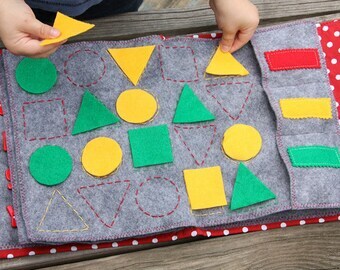 My fascination with creative workmanship and sincere desire to share my knowledge brought me to teaching handwork to adults and kids, both curious explorers and Waldorf students. Designed with attention to details and learning in mind. Handmade for Someone Very Special. Treasured today, kept as a family heirloom ever after. Please let me know if you need assistance in choosing the most relevant for you set of activities or play items. I’d be honored if some of your tomorrow’s memories would be created with my help. My name is Tatiana and I am happy to see you in my shop Fox Majeure. All the items are designed and handmade by me. 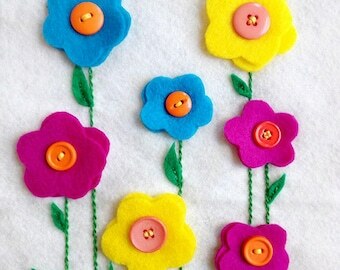 Please, remember that some variations in products are inevitable due to being handmade. Every returning customer gets 10% off any one item. All items come from smoke and pet free environment. Comments and questions are most welcome and appreciated. Please, feel free to convo or e-mail me at FoxMajeure [!at] gmail.com. Check back to see new arrivals to Fox Majeure! I do my best to photograph and describe my items as precisely as possible. Please pay attention to the description - some of the items in my shop are represented by the photo of a sample and will be custom made for you. The actual items for sale are clearly marked as "the actual item is pictured" or "ready to be shipped." I hope you will be happy with your purchase. In case of a justified return I will gladly issue a full refund minus shipping fees. Payment is accepted through PayPal and direct pay with a credit card. I do not accept bank deposits, checks or money orders. Although if you have a special need, please convo or email me. All orders are shipped to the address provided in the initial Etsy order unless stated otherwise. Please contact me if you need to upgrade or change the shipping agent. On international orders the default shipping is First class by the United States Post Office. Please, be advised that this method is trackable only on the US territory. Outside the US it will not be trackable by number. If the total price of the order is more than $100 I strongly recommend upgrading to a fully trackable service. To get a door-to-door tracking for international orders the shipping method is Express Priority International mail by USPS or alikes by FedEx or UPS. Packages to Canada get a special discounted price. The actual price paid is indicated on customs forms. The item is marked as merchandise. Any customs fees are a buyer’s responsibility. I pack every item carefully to avoid any possible damage. Please, let me know if you prefer recycled materials for packaging. Any transportation-related delays, damages or loses are the responsibility of a shipping service. Once the item is shipped I do not have any control over it - please contact the shipping agent for clarifications. Please, be aware that those given online are estimates and might be different from the actual shipping cost. 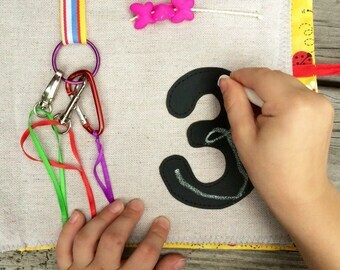 Please, note: I make some of my items (quiet time books, play mats) very rich with elements – beads, buttons, eyelets, etc. 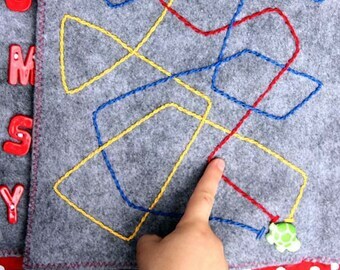 Other than being a significant part of activities, they add color and texture to tactile exploration. 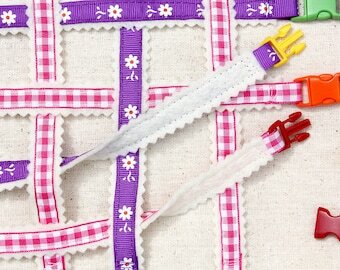 Though securely sewn onto pages these little parts may become a choking hazard when torn. Please check frequently if any came loose. By purchasing my work containing small and possibly detachable elements you recognize the potential risks and are fully responsible for the its prevention.